Are We Going to Kiss our Cables Goodbye? Keyssa recently announced a new wireless technology: Kiss Connectivity. Kiss is a point-to-point technology (as in one centimeter apart) that enables devices to transfer or stream data at 6Gb/sec, which is faster than USB 3.0 5Gb/sec speed. Keyssa promises the transfer of entire movies in seconds. Picture NFC on some serious steroids and you’ve got it. The table below shows where Kiss sits on the speed spectrum compared to some other popular connectivity technologies. Some big names in the electronics industries are behind this company. The Chairman of the Board of Keyssa is Nest’s CEO Tony Fadell. Keyssa is backed by Intel and Samsung, among other companies. If Kiss takes off, it will squash TransferJet’s chances of making much of a splash in the market; it has been struggling to make headway already. Depending on how much it costs, and the security level it brings, it may make a dent in NFC’s market as well, but NFC is really suited for enabling things like smart cards, tickets, and hotel keys where small bits of data is being transferred, so the overlap there is not as great. Pricing has not been announced yet for Kiss. Read more about Are We Going to Kiss our Cables Goodbye? The markets for wearable devices, smartphones and tablet PCs are large and growing quickly. By 2018 sensor sales into mobile devices and wearables will reach $28.3 billion. There are over 75 sensor vendors targeting these markets. More sensors are being designed in which enable new features and functions. IoT Security: At What Cost? Read more about IoT Security: At What Cost? Semico Research's Jim Feldhan will speak at SEMICON Japan on Thursday, December 4. The title of his talk is "Market Dynamics Driving the Internet of Things." Last week at the MEMS Executive Congress in Scottsdale, Arizona (Nov. 5-7, 2014) two separate announcements were made that will have long term impact on sensors. The MEMS Industry Group announced the first open source algorithm community for sensor fusion and the MIPI Alliance introduced a new sensor interface specification. The I2C, also known as I Squared C, standard has been used extensively for sensor interface. Many sensor hub controllers, mostly microcontrollers, use I2C for connecting to sensors. But I2C has its limitations in terms of power, speed and scalability. SPI is another interface standard that is used for sensors, but this requires more pins. This new standard has been developed because of the steadily growing proliferation of sensors in smartphones. A new standard was needed that could be scalable. MIPI has developed I3C with the participation of sensor vendors and other companies in the mobile ecosystem. Will the Ramp of FinFET Manufacturing Capacity Shift Market Dynamics? Read more about Will the Ramp of FinFET Manufacturing Capacity Shift Market Dynamics? The 3D printing world is an exciting place to be right now. For do-it-yourselfers with an artistic or engineering bent, 3D printing delivers a whole new toolbox, enabling designs that were not possible before with exciting new materials. 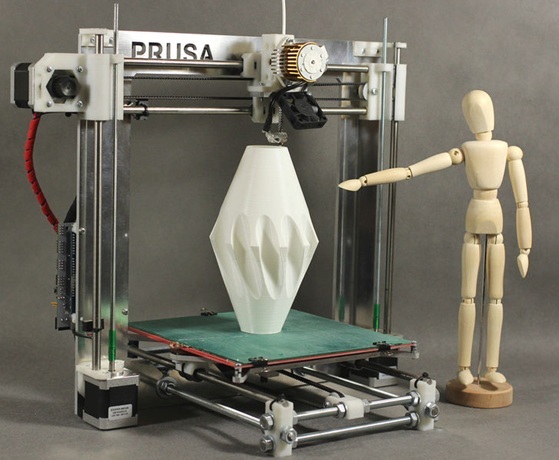 These DIYers will often build their own 3D printers from scratch. The RepRap movement was formed with the goal of creating a self-replicating manufacturing machine. The first self-replicating 3D printer was built in 2008 by mechanical engineers at the University of Bath. Since then, the hobbyist 3D printer movement has blossomed from a grad school project to thriving hobbyist community. A 3D printer can be built from scratch using almost any building material (plywood, laser cut acrylic, machined aluminum, LEGO bricks, etc. ), however all printers need at least one type of commercially manufactured hardware: electronics. Within the Smart Home, Semico has been tracking over 70 items that every household can expect to purchase that will include some type of sensor and wireless chip by 2020. This new connected home includes white goods (clothes washer, clothes dryer, refrigerator, dishwasher, etc. ), HVAC, lighting, small appliances, door locks, security system, windows and more.